I don't think I've ever posted a lasagna here! For someone who loves to eat pasta, I don't actually cook it very often. But there is a specialty foods store in my neighborhood that I sometimes wander into when I want to get my wallet in trouble, and one day, I walked out with an $11 pint of ice cream and some beautiful, rainbow striped lasagna noodles. Neither were things that I needed, but both made me very, very happy in that moment. The ice cream was consumed pretty much immediately, but the lasagna noodles sat in my pantry for almost a year, as I tried to figure out something to do with them. I had no immediate plans to make lasagna when I bought them, but the bigger problem was that I wanted whatever recipe I made to live up to the gorgeous noodles. You can't just bury rainbow stripes in meat sauce and call it a day. At least, not in my house. After the noodles had been sitting for a few months, I happened to stumble my way into a crazy delicious pesto while trying to use up some pumpkin seeds and a bunch of basil (pretty much the source of all the pesto in my house). It occurred to me that I could freeze the pesto and then, when Spring arrived, pair it with a spinach ricotta and some colorful veggies to match the pasta. So, fast forward a few months later and here we are! But I couldn't stop with just the veggies. I started to really crave that traditional lasagna flavor of cheese, red sauce, and meat, so I decided to add a meat sauce, but with chicken to keep it light for spring. I took a cue from Marcella Hazan and made a buttery, rich tomato sauce for the base, added some ground chicken and my favorite umami booster, and the resulting sauce was something very special, deserving of my special noodles. It's also a wonder I managed to put any in the lasagna, as I couldn't stop eating the stuff with a spoon. I'm definitely making another batch to just pour over a bowl of polenta! 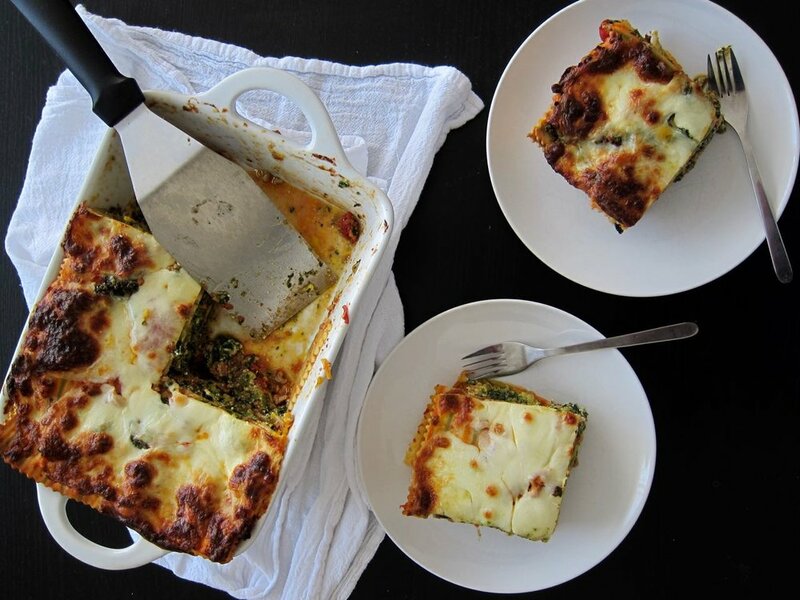 There is a lot going on in this lasagna, but it's worth it when you pull it hot from the oven, with pesto seeping through the cheese and meat sauce bubbling up the sides. You may just burn your mouth trying to shove this in way before the cheese has cooled from molten to edible. I warned you. I've laid out all the ingredients here in their separate lists for each component, because all individual layering components can be made ahead, though the directions below are for one lasagna-making session. You can make almost everything while the tomato sauce cooks, as long as you have all your ingredients ready to go. A good mise en place can really help here. Start the tomato sauce: Add tomatoes and their juice to a medium pot with the butter and the onion, the oregano, and a pinch or two of salt. Bring to a simmer and cook about 45 minutes, crushing the tomatoes against the sides of the pot with a wooden spoon as they begin to break down. While the sauce is simmering, prep the veggies. Grate the zucchini, squash, and carrot (this is easy to do all at once with the shredding attachment of a food processor). Add all grated veggies to a collander and sprinkle with 2 tsp of salt. Toss to distribute the salt. Let veggies sit and drain for 10 minutes. Then squeeze as much of the water out of the veggies as possible and transfer to a small bowl. Set aside. While the veggies are draining, make the pesto. Toast the pumpkin seeds in a skillet until fragrant and beginning to pop a bit. Cool for a minute or two, then add to a food processor with the garlic and basil. With the processor running, add enough olive oil to make a thick sauce/paste. Add salt to taste. Brown the chicken. Heat a little olive oil in a skillet and add the chicken, shiitake powder if using, and 1 tsp of salt. Cook until browned and just starting to cook through. Add the chicken to the simmering tomato sauce and continue to simmer to the 45-50 minute mark, then lower the heat to keep warm. Cook the veggies. Add a little more olive oil to the pan, then add the clove of minced garlic and cook until fragrant, about 1 minute. Add the wrung-out veggies and saute for 1-2 minutes more, just to incorporate with the garlic and cook out any extra water. Set aside to cool. In a large bowl, stir together ricotta, parmesan and dried oregano. Wrap the spinach is a towel or press in a mesh strainer, and squeeze as much water out of the spinach as you can, then stir into the ricotta mixture. Season with salt and pepper to taste. Once you have all your components ready, you can cook your noodles! You can also do this while making everything else, but if you don't want one more thing to keep track of, you can make them at the end. Bring a large pot of well-salted water to a boil, and cook the noodles in a couple batches until very al dente, about 6 minutes. Lay out on a plastic lined baking sheet so they don't stick. Heat oven to 400 degrees. Butter a baking dish and spoon a thin layer of the meat sauce on the bottom. Divid the noodles in whatever way they fit in your dish so that you will end up with three layers of noodles, then layer and repeat: noodles, 1/3 meat sauce, 1/3 ricotta spinach mixture, 1/3 veggies, 1/3 pesto, noodles, until you end with your final layer of pesto. Top the layers with the mozzarella. Bake for 30-35 minutes, until bubbling and cheese is melted and browned at the edges. Let cool for 5-10 minutes, then dig in. Lasagna can be prepared a day or so ahead of baking, and then wrapped in plastic and stored in the fridge. When ready to bake, just unwrap and pop in the oven. I would add about 5 minutes to the cooking time. I made my lasagna in a smaller pan, and layered the extra ingredients into a loaf pan. If you have a more traditionally sized lasagna pan, everything should fit nicely into one. Now, about the veggies. You might look at the directions and think, "what the hell Allie, can't I just saute them to remove all that water?" To which I'll say, sure, you can do that, but with the method I used, you can minimize the active cooking time while still removing a ton of water, allowing you to make the other components more quickly, and you won't end up with either mushy vegetables or watery lasagna. High fives all around! You could even skip the step of sautéing them after salting them, but I like giving them a toss in the garlic-infused oil.